The term “pop music” is a 20th century invention -- it originated in England in the 1950s to describe the rock and roll frenzy that was sweeping the nation. One of the many inspired things about the first part of New York drag artist Taylor Mac’s lunatic-brilliant A 24-Decade History of Popular Music is how it reminds us that pop music in this country is actually much older than that. Another, is a sense that the greatest hits of the 1770s and 1780s -- the tunes that rocked the taverns and bawdy houses of our fledgling republic back in the days when England was pretty unpopular and a mohawk was a member of a native American tribe rather than a way to wear your hair -- could easily go viral today. Mac is training for a 24-hour marathon performance of his A 24-Decade History of Popular Music in New York later this year, in which he will devote an hour of stage time to each decade from 1776 to the present day. For now, he’s getting into shape for this feat by undertaking just the first two parts -- or six decades / six hours worth of songs -- in San Francisco as part of the Curran Theatre’s Under Construction series of experimental performance. I caught the first three decades (1776 - 1806) on opening night and can’t wait to go back for Part Two (1806 - 1836) in a few days. In his show, we first encounter Mac when he appears high above the stage on a balcony above the Curran's orchestra section. Wearing an elaborate hooped dress fashioned from brightly-colored foil ribbons and a voluminous wig that makes him look like Marie Antoinette had an accident in a Mexican bodega, the artist begins an epic journey through 240 years of U.S. musical history that’s as timeless as it is prescient. That’s in part because of music director and pianist Matt Ray’s creative song arrangements, which make crusty old tunes like “Yankee Doodle” and “Amazing Grace” sound like like they were written just in time for this year’s Grammys. The performances carry it too: Although the show is currently in workshop mode, with Mac, Ray and the band still ironing out a few wonky transitions, the team manages to breathe new life into both well-known and obscure 18th century ditties. And it's Mac’s mercurial tenor that anchors the experience: the drag queen’s voice is as colorful as his flamboyant sense of style. There’s crushed velvet and feathers in Mac’s mellifluous ballad singing and 8-inch spiked heels in his drinking song belt. It isn’t just the music that makes three hours of sitting on an uncomfortable plastic chair on a rickety riser breeze by, or Mac’s eye-popping wardrobe. (In addition to the gaudy get-up mentioned above, there’s an “architectural” dress involving a pair of enormous doric columns, each with a plastic doll’s head dangling from the bottom, and another costume topped with an amazing wig made of wine bottle corks and sheaths of barley.) The thematic through-line connecting the musical numbers also helps to take A 24-Decade History of Popular Music beyond regular drag cabaret. Mac underpins each decade of the musical journey with commentaries on broad social issues, which he spices with liberal amounts of scathing humor and personal anecdote. The first decade roughly and comically charts the founding principles of post-Revolutionary U.S.. In the second decade, Mac takes a piquant look at women’s lib. Part Three is all about booze, where the ripe innuendos of raucous drinking songs like “Nine Inch Will Please a Lady” clash against the stiff, bonneted warblings of a scandalized Temperance Choir (a small guest ensemble of classically-trained singers.) By the time we reach the end of the show, the do-gooder choristers get their comeuppance, pelted in a hailstorm of ping-pong balls. 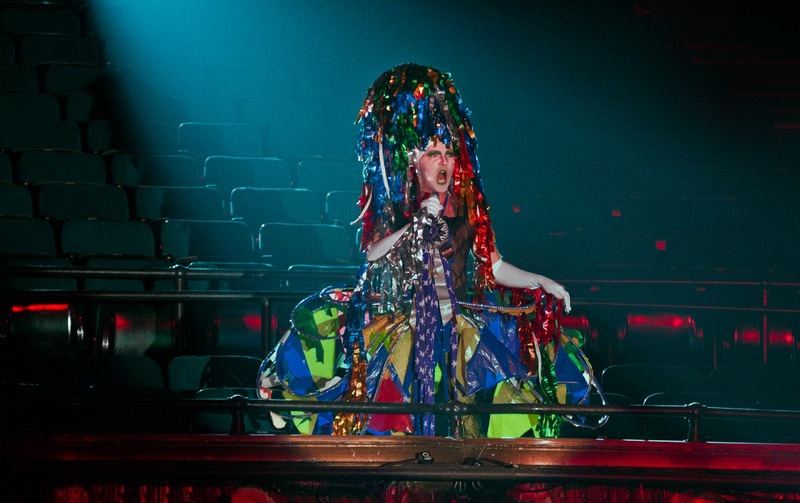 In addition to having fun with a piece of political history, the gambit neatly plays out a more contemporary stand-off between the scrappy, underground world of drag performance and the straight-laced mores of today's arts establishment. Here, the political becomes personal, as Mac himself has been faced with negotiating these two worlds in his own career. The socio-political content at times feels a little strained, like when Mac spins a long feminist diatribe out of a mopey little ditty about a young woman fretting about why her beau hasn’t come home from the fair. But Mac’s ability to work the crowd, in particular his obsessive, sweetly overbearing use of audience participation, mitigates this shortcoming. He makes this otherwise sprawling historical project feel intimate and personal. Mac’s insistence on bringing the crowd into the proceedings might seem tiresome and gimmicky to some -- one person complained to me about being pulled into a conga line and forced to wear a pair of fairy wings. But overdoing it, going over-the-top, “carrying on for just a bit too long,” as Mac himself puts it, is part of his stage technique. It’s there to make a broader point about just how topsy-turvy the world is. And like an old song that’s so familiar that it’s stuck in all of our heads, we’re all in this thing together, like it or not. 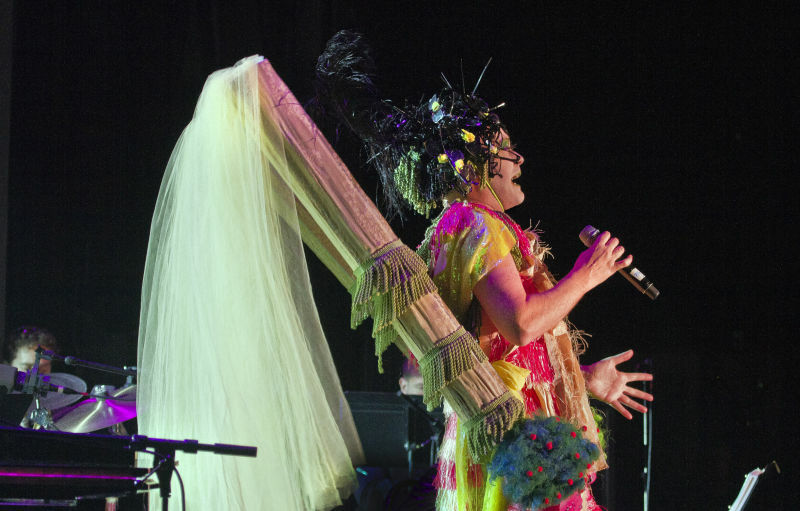 Taylor Mac's A 24-Decade History of Popular Music runs through Saturday, Jan. 30 at the Curran Theatre in San Francisco. Details here.